What do a 350 year old tree and a glass of iced tea have in common? Stumped? Let me give you a hint it starts with a 'Wednes' and ends with a 'Day'. That’s right, our Wednesday in Charleston. 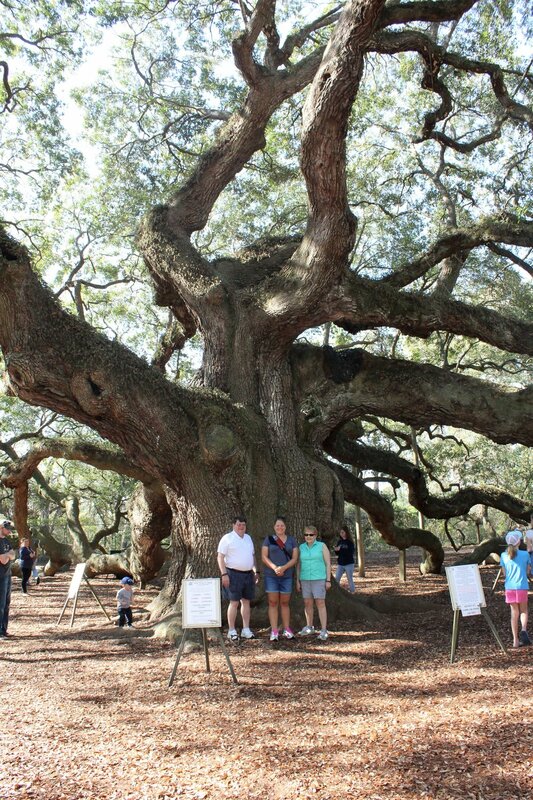 When doing the following Google searches, we came across we came across the Charleston Tea Plantation and Angel Oak. Having spent the last few days in the city, we decided to venture out to a more rural area surrounding Charleston. 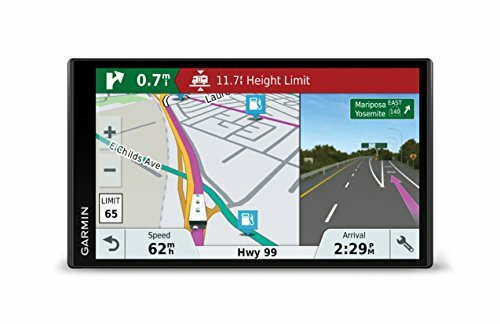 What to do in (city name)? 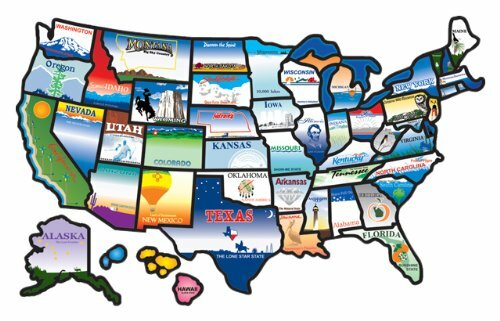 Free things to do in (city name)! Must Sees in (city name)! My parents, Russ, and I started with a visit to a tree. Why yes, I did say we visited a tree. Not just any tree though! The Angel Oak Tree is estimated to be 400 years old. It is a Southern live oak, meaning it always has green leaves since it never drops all its leaves at once. The Angel Oak stands at 65 feet tall, so there are many, many trees that are much taller. 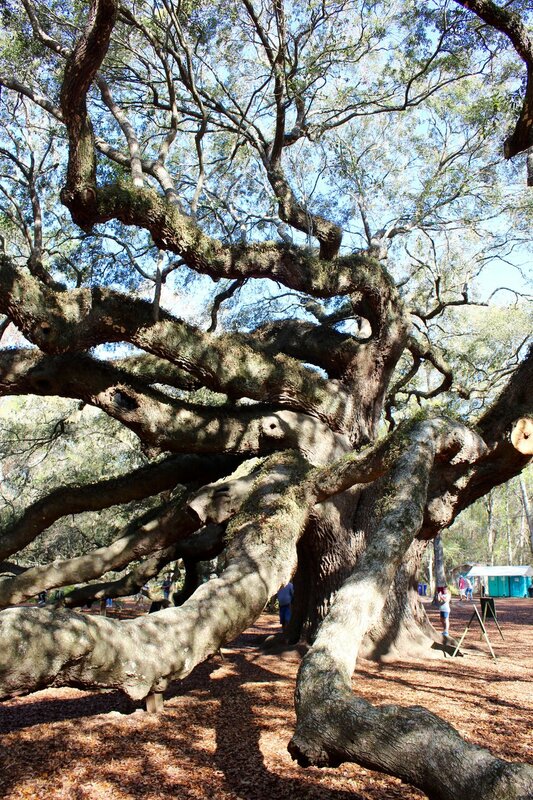 Live oaks are known more for their impressive canopies than their stature. This species native to the lowcountry tends to grow more outward than upward with branches reaching in all directions. In several places the branches drive themselves underground before growing back up above the surface. The Angel Oak’s longest branch is 187 feet. The Angel Oak provides just a bit of shade, okay 17,200 square feet worth! Several picnic tables in the area would make this a great place for a lunch break. As well, there is a cute little gift shop to check out. 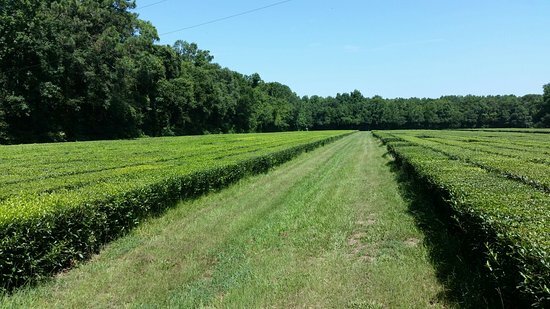 Next up was a visit to the Charleston Tea Plantation, located on Wadmalaw Island. As American’s only tea factory, it was a unique place to visit. The sandy soil, sub-tropical climate, and rainfall create a welcoming environment for cultivating tea. Upon arrival, we were warmly greeted by an employee who explained all our tour & tea options. We started with several tea samples while we waited for the next factory tour (every 15 minutes). Since we were visiting out-of-season, the machinery was not running. Rather, three TV locations guided us through each step of the tea-making process. We learned that both black & green tea are produced from the same plant! Something new to us as we always thought there were two different kinds of plants. After trying more than our fair share of tea samples - Russ perfected his perfect cup consisting of iced mint tea with a splash of crystalized lemon. While mine looked a bit more like half American Classic & half Peach on ice. 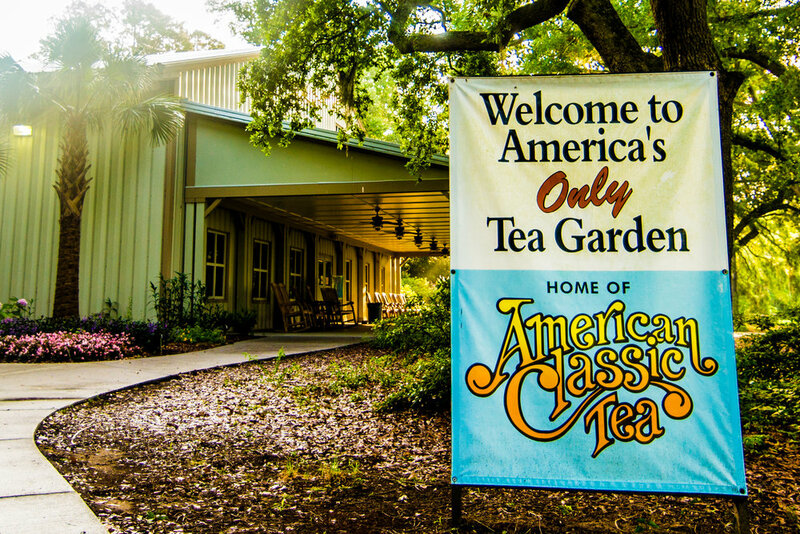 The Charleston Tea Plantation teas are the only brand of tea made exclusively with 100% American-grown tea. Remember that one for your next trivia tournament! You’re welcome! If you are a tea lover, the cute gift shop will be right up your alley - chocked full of fun tea accessories & cute tea decor. We passed on the trolley tour, but I’m sure it would be a fun, informative ride. The tour is just over a half hour and takes you out to the acres and acres of tea bushes with a stop at the greenhouse. The trolley tour is the only paid activity at the Charleston Tea Plantation ($10/adult, $5/child). If we are back during harvesting season, we would certainly consider a trip back for the trolley tour. All of us enjoyed both of these off-the-beaten path stops today! If you are short on time in the Charleston area, I would recommend sticking to a tour in the historic downtown district. 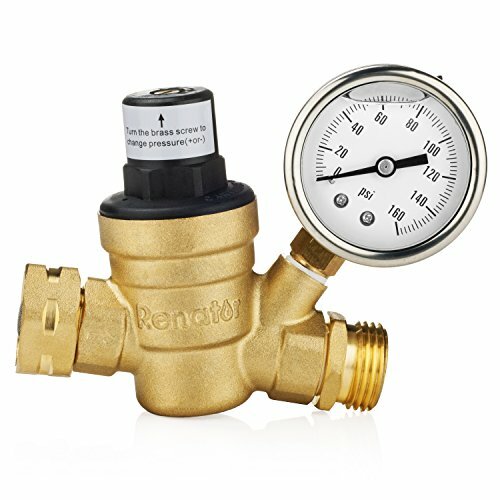 But if you find yourself with an extra day during your stay, certainly make the trip and check out these two unique and frugal finds. We had a few errands to run, so we took the afternoon off as tourists. We picked up the truck from the Cummins dealer where it was having some issues fixed. As always - ChaChing! Good thing today's festivities were free. We then hooked back up with my parents for one final hooray in Charleston. I also had something on my list that had remained unchecked - the Pineapple Fountain. I had heard about it and had seen it on many postcards, but we had yet to come across it. My mom had noticed pineapples on several of the homes and told me that it was the sign of Southern hospitality. Pineapples were often a part of grand centerpieces at large Southern dinner parties. From that, the fruit became a representation of the warmth of friendship that was shared at gatherings. So architects began incorporating pineapples into decor details around Charleston. The history of the pineapple explains why the Pineapple Fountain has become an iconic spot located in Waterfront Park. It was a lovely fountain with a backdrop of the Charleston harbor on one side and lovely historic buildings along the other. 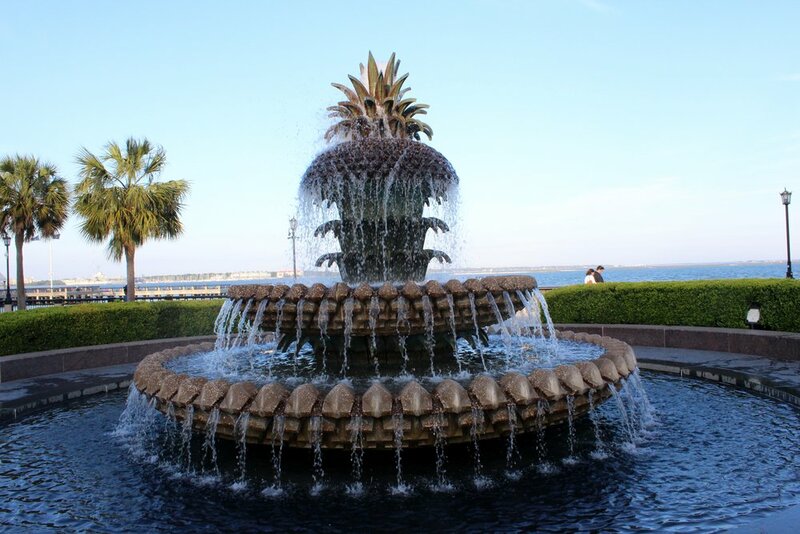 In comparison to the history and age of most things in Charleston, the Pineapple Fountain is still in its infancy since it opened in 1990, the spring after Hurricane Hugo. Making the fountain even cooler was that wading is not only permitted, but welcomed. The temperatures were crisp and the wind was brisk, so we didn't partake in any splashing. However, I love that it gives the fountain a dual-purpose of beauty and play. Glad we had a chance to check it out! We finished the evening with an enjoyable dinner at Fleet Landing. Thanks Mom & Dad - we loved exploring, dining, talking, and laughing with you.